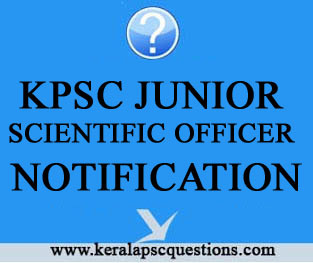 Applications are invited through online only by ONE TIME REGISTRATION scheme from qualified candidates for appointment to the under mentioned post in Kerala Government Service. The above vacancy is now in existence. The list of selected candidates published by the Commission in response to this notification shall remain in force for a minimum period of one year provided that the said list will continue to be in force till the publication of a new list after the expiry of the minimum period of one year or till the expiry of three years whichever is earlier. Candidates will be advised from the said list against the vacancies noted above and that may be reported to the Commission in writing during the period of currency of the list. Note:- 3% (Three percentage) of vacancies for the post shall be reserved for eligible Differently abled candidates vide G.O. (P) No.119/05/SWD dated, 16.08.2005, G.O. (P)43/2009/SWD dated 13.10.2009 & G.O. (P) No.61/12/SWD dated, 17.10.2012, (Accordingly Locomotor Disability/Cerebral Palsy, Hearing Impairment categories are eligible for 3% reservation as per rules). Masters Degree with at least 50% marks in Chemistry or Forensic Science or Bio-Chemistry of a recognised University. Note:- KS & SSR Part II Rule 10(a)ii is applicable. Community, age etc. have to be produced as and when called for. 9. Last date for submission of application:- 03.02.2016 Wednesday upto 12.00 Midnight.